A series of talk and musical programs assembled from our various trips to Venice for the Biennale dating back to 2005. The programs range from round table discussions to interviews to DJ sets to virtual pavilions rendered in music and sound. 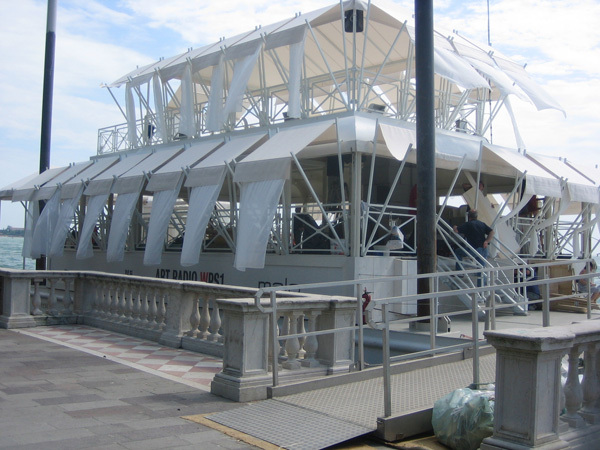 On two occasions (2005 and 2007) we broadcast live on Italian FM radio from a boat moored near the Giardini. In 2011 our roving reporters covered the scene while the interview booth was headquartered near Piazzo San Marco. We also partnered with artist Federico Diaz and his sculpture-building robots at the Arsenale to design a special series called Robot Radio. 2013 brought us together with LaRete Art Projects and the Venice Agendas series produced by workinprogress for interviews and discussions. Venice 2005: WPS1 Venice Interviews: Agnès b.